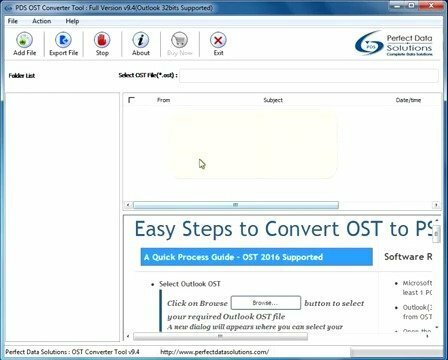 OST to PST Converter is most favorable software that converts inaccessible OST files into Outlook PST and additional format like- EML, Office 365, MSG, HTML, PDF and MBOX including all elements such as calendar, contacts, scheduled task, journals, appointments, zip attachments, images and videos etc. This application has lots of updated features, also works on all Exchange and Outlook versions (32 and 64 Bit). Show preview of emails before conversion. Convert Encrypted OST file without any problem. Convert OST file into PST, MSG, EML, HTML, PDF and MBOX including Email header information (to, from, cc, bcc, date, time and subject). Filter emails as per defining dates “Start date” to “End date”. Split converted PST file into different sizes 1GB, 2GB, 3GB and 5GB. Import OST to Office 365 with complete mailbox items. Support Windows versions up to 10 and Outlook versions up to 2016 (32 and 64 Bit). •	Pentium Class Processor- Windows 2000/ 2003/ XP/ Vista/ 7/ 8/ 8.1 and 10. •	Ram Requirements- 64MB RAM (128 recommended). •	Supported Operation Systems- Supports up to Windows 10. •	Supported Exchange Server Version- Supports Microsoft Exchange Server version up to 2016. •	Supports Outlook version- Supports Outlook version up to 2019 (32 or 64 Bit).